We now sell premium drink and food packages for VIP tables! Please contact us on our groups form for options to get the best out of your night at Cafe Wha?! The World Famous Cafe Wha? House Band is truly a powerhouse of talent. 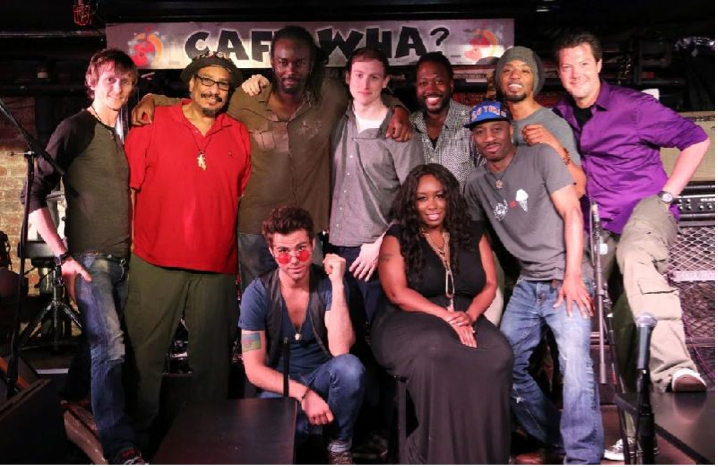 Featuring a full 9-piece band, this world renowned house band has been in existence in some form or another since 1988. The Cafe Wha? House Band performs the biggest musical hits of the last 50 years every Wednesday through Sunday right here at Cafe Wha? You never know which famous musician might be sitting in with the Cafe Wha? Band any night, and you could be privy to a once-in-a-lifetime, up close and personal performance! Doors open and seating starts every night at 8:00pm. For 9:00 pm shows, ALL members of your party must arrive by 8:45 to be guaranteed seating. Your reservation is not guaranteed if you show up after 8:45 pm (even if you come with your entire group). For 11:15 shows we suggest you arrive by around 11:00 but no later than 11:15 to avoid waiting in line. Cover charges are as follows: Sunday ($10), Tuesday ($10): Wednesdays ($10): Thursdays ($10): Fridays ($15), and Saturdays ($15). FOR GROUP RESERVATIONS : If you are a party LARGER than 15, you must connect with our Groups Department at least one week prior to your scheduled reservation. To email our Groups Department, click here. Guests from the 9:00 pm show on Friday and Saturday night who wish to stay for the second show at 11:15 pm may be subject to a $6 "stay cover" charge. Guests will be alerted prior to the second showing if this stay cover is in effect. Please note that these show times and cover charges apply only to house bands. For information on early shows (those beginning before 9:00pm), please refer to the posted calendar or to the specific band's website. Management reserves the right to alter the cover charge and other special offers and coupons on occasion. Exceptions always include the evening prior to any national holiday, and the week between Christmas and New Years. Cover charge changes will be posted under the "Exceptions" section at least two weeks prior. You will also be notified of any changes by management before being seated the night join us. Weekdays: Cafe Wha? permits guests under 21 to attend our shows if accompanied by an adult. There is a $20 minimum for guests under 21 on weekdays, in addition to the evenings cover charge. Weekends: For all age requirements on weekends, please connect with our groups deparment at least one week prior to the show to see if you can be accommodated.